Baird's Sandpiper: Medium sandpiper with scaled, gray-brown upperparts, white underparts, and dark-spotted, gray-brown breast. Crown, face, and neck are buff with fine, dark brown streaks. Rump is white with dark central stripe extending through the center of gray-brown tail. Black legs and feet. Bar-tailed Godwit: Large shorebird, long upcurved bill, scaled brown, black and gray mottled upperparts, pale red-brown underparts. Tail is white with distinctive dark bars. Legs, feet are dark gray. Feeds by wading in water, probing mud with side-to-side motion. Direct flight with steady wingbeats. 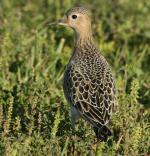 Black-bellied Plover: Medium-sized shorebird with black upperparts vividly marked with a white spot on each feather. Face, throat, and belly are black. White forehead and crown, extends over eye and down back, sides of neck. Black armpit and white rump, vent, and wing stripe are visible in flight. 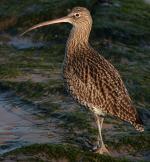 Bristle-thighed Curlew: Large, brown-streaked shorebird with long decurved bill. Eye-line is dark, contrasting eyebrow is white. Rump is cinnamon-brown. Bristle-like feathers at base of legs are inconspicuous. Legs and feet are blue-gray. Strong, swift direct flight with legs trailing behind tail. Buff-breasted Sandpiper: Medium sandpiper, buff wash over entire body except for white vent. Upperparts are black-spotted and streaked, underparts are slightly scaled. Shows white wing linings in flight. Has white eye-ring and black bill. Legs are yellow. Swift direct flight with rapid wing beats. Curlew Sandpiper: Medium-sized sandpiper with mottled rufous, white, and black upperparts. 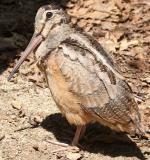 Head, neck and breast are a rich rufous while vent, undertail coverts and underwings are white. Black bill is long and slightly decurved. The legs and feet are black. Swift direct flight with rapid wing beats. Dunlin: Medium-sized sandpiper with black-streaked, red-brown upperparts, conspicuous black belly patch, and streaked breast. The black bill is long and slightly decurved. Legs and feet are black. Wades in shallows and uses bill to probe and pick up food. Swift direct flight with rapid wing beats. Gray-tailed Tattler: Medium sandpiper with gray upperparts and cap, white eyebrow and throat, gray streaked breast, and pale gray underparts. Wings and tail are dark. Legs and feet are yellow. Eats insects and larvae, picks up food in sand and water. Direct flight, quick wing beats. Greater Yellowlegs: Large sandpiper with mottled brown, gray, and white upperparts. Underparts are white with dark streaks, spots. Bill is slightly upturned. Legs are long and bright yellow. Long barred tail and white rump are conspicuous in flight. Swift direct flight, sometimes at great heights.